PTD National Chairman, Comrade Akanni Oladiti Commissions Emadeb Unit Office, As He Extols Union's Virtues | Welcome to Dare Lasisi's blog! "Gone are the days that tanker drivers are seen as nobody or quacks, today by the grace of God we are among key stakeholders to be reckoned with whenever government at any level wants to introduce or implement any programme or policy in the nation's oil and gas sector. Under my leadership you will all recall that PTD now owns a world class hotel at the nation's capital in Abuja and I make bold to tell you that very soon we will soon be commissioning our filing stations among other life impacting investments. We now have a Union that we all can be proud of. He continued, "Gentlemen and ladies, I feel highly elated today that Emabed Unit of PTD achieved this enviable mark by erecting this beautiful ultra modern edifice that can be called an office, and as you can see its very befitting, the era of using canopies, kiosks and abandoned containers as office is gone for good. I am really proud of this Unit and I urge others to emulate this shinning example, NUPENG and particularly PTD must be known for excellence in all ramifications. 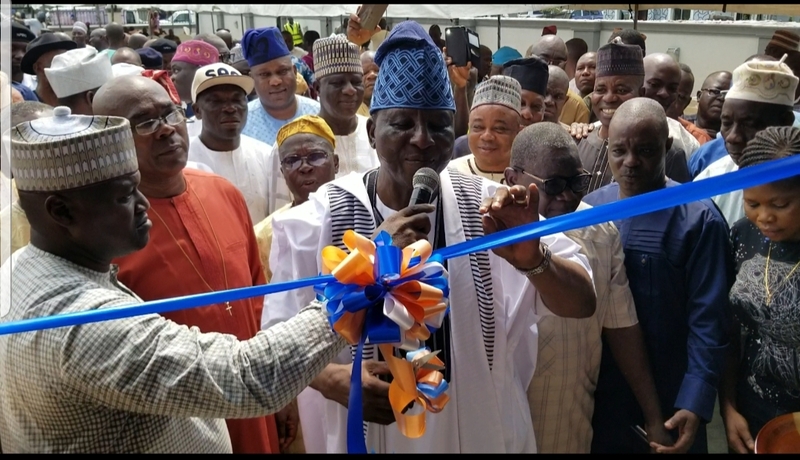 However the Chairman of Emadeb PTD Unit who doubles as Lagos Zonal Chairman of PTD used the occasion to thank the National Chairman for his physical presence as well as delivery of his goodwill message that was attributed to the commissioning of the Unit's house. He urged members to always think about the Union first above any other interest and that they must respect the rules of engagement at all times. "I return all glory and honour to God, it's not our making at all, if God doesn't build a house the builders will only labour in vain. I want all of us not to renege in adhering to good conscience in the overall interest of this great Union." Comrade Akinlolu stated. Others who registered their presence at the event which coincided with the quarterly meeting of the Lagos Zonal council of PTD were, Comrade Solomon Kilanko (National Deputy President of NUPENG), Comrade Tayo Aboyeji, (Chairman Lagos Zonal Council of NUPENG), PTD Lagos Zonal Council Deputy 1- Alhaji Saheed Adigun Gbolahan, Zonal Secretary, Alhaji Lawal Abidoye, Alhaji Tokunbo Korodo, Baale of Ijegun-Egba, High Chief Akogun Raheem Alade Olojede, etc.